You might have fond memories of being a 7-year-old -- things you did with your friends, a vacation you took, new skills you learned in second grade. When Cubs infield prospect Tyler Alamo thinks back to that age, the first memory that pops into his head is running with bulls. The 23-year-old grew up in Artesia, California, a small town in Los Angeles County where Portuguese culture -- including a bloodless, Californian version of Portuguese bullfighting -- is still prominent. His father, Gary, worked as a bullfighter with the Forcados De Artesia group. Alamo remembers a childhood centered on bulls and calves, watching his father face charging animals. He took part in a Memorial Day tradition himself as a youngster in Artesia. "Every year, there is this big soccer tournament and it lasts three days during Memorial Day Weekend. And when it's over, there's this bull ring and they randomly let out bulls and cows and anyone can jump in there. A lot of the time people get messed up," he said. "When I was 7, I jumped in there and tried to run with the bulls. I remember I slipped and a bull got me pretty good. I was banged up pretty bad, but I was fearless. I got back in there and did it again. "The bulls can sense if you're scared, so you have to be fearless." Gary Alamo was born in the United States to Portuguese immigrants and grew up immersed in their culture, which he passed down to his four sons. The oldest, a 2013 24th-rounder who reached Double-A this year, maintains he might have taken up the family business had he not been drafted. In fact, the possibility of playing pro baseball wasn't even on Tyler Alamo's radar as a kid. "From the time I was born until I was 10, I remember watching my dad bullfight, and honestly, I definitely thought I would be doing that today. If it wasn't for baseball, I don't have any doubt that it would still be part of my life," he said. "I'm actually not really sure how baseball started. Growing up in the Portuguese culture, everything was either soccer or bullfighting. But I hated soccer, so I played baseball basically my whole life." Alamo referred to his passion for baseball as "coming out of nowhere," but he did start playing the game at age 3. He became an Angels fan who looked up to Vladimir Guerrero, Troy Percival, Troy Glaus and Tim Salmon. He even tried to model his swing after Salmon's. But while his baseball development progressed, lessons he learned from watching his father helped him excel at each level. "There's a lot more to bullfighting than people may think. It's not just standing up there and trying to stop a bull," the younger Alamo explained. "They do a lot of studying and there is a lot of practice that goes into it. It's a lot of technique, and watching my dad prepare each and every day, and seeing his hard work and fearless mind-set -- it just rubbed off on me and definitely translated into baseball. "You can't be unsure or just partially committed when a bull is coming at you at full speed. You have to be 100 percent engaged and just take a chance by really giving it your all. It requires complete focus, and really, you have to be all in." Alamo decided to go all in with baseball at Cypress High School, where he attracted the attention of the Cubs. He began his professional career in the Rookie-level Arizona League in 2013, appearing in 11 games -- three as a catcher -- and collecting three hits and four RBIs. He returned to the Arizona League the following year and amassed 20 hits -- including a pair of doubles -- and 10 RBIs over 31 games. That performance earned him a promotion to Class A Short Season Eugene for 2015. After hitting .261 with the Emeralds, Alamo took part in his first full season in 2016 with Class A South Bend. The grind of catching and a stint on the disabled list limited Alamo to 85 games that year, but the 6-foot-4, 200-pounder began to showcase his power with 17 extra-base hits. The next season was a breakout campaign for the right-handed hitter as he posted a .281/.322/.422 slash line with 12 homers, 24 doubles, 61 runs scored and 42 RBIs in 114 games for Class A Advanced Myrtle Beach. His .281 average ranked sixth in the Carolina League, and he displayed some versatility in the field, playing 56 games at first base. 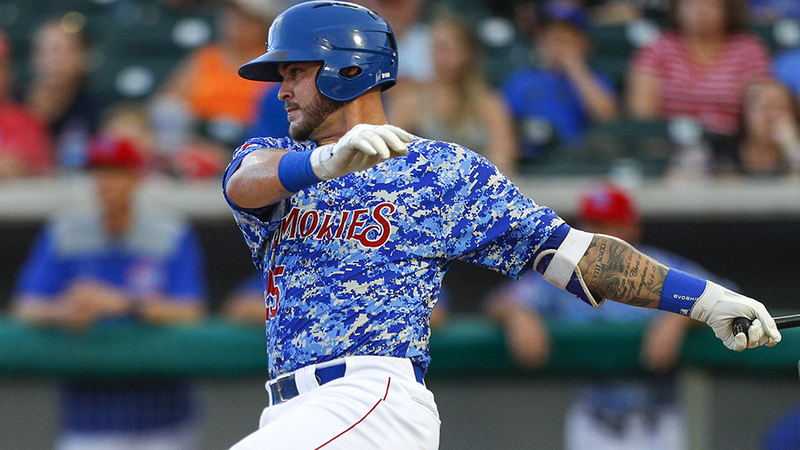 Alamo's performance also earned him MiLB Organization All-Star honors as a utility player. "I think the biggest thing that helped me was just being older and putting on more muscle," he said. "I figured out how pitchers were pitching, and I developed a plan at the plate and stuck with it and that worked out really well. I also got more at-bats than ever. [Pelicans' manager Buddy Bailey] put me behind the plate, at first and DH, so it gave me a lot of opportunities at the plate and that made a huge difference. "Buddy Bailey is a tough, old-school coach. He loves to win and he loves to work. He really gave me the reps I needed and all the early pregame work to be ready to go every day. It just translated into my game." Alamo returned to Myrtle Beach to begin 2018, but a foot injury derailed his season, sidelining him for more than two months. In mid-May, he hit a grounder to the left side and watched the fielders play the ball to see whether he had a chance at legging out an infield hit. While he was distracted, he misjudged where the first-base bag was and landed awkwardly on the front, left corner of it. As he described it, his foot "just went." "I just remember this sharp pain in my heel, but being me, I just tried to play through it. I always want to be out there," he said. "So I told the trainer there was some pain in my heel, and we did extensive treatment, and wrapped it really good every day, iced it, foam in my cleats, but the pain kept getting worse. I tried to hobble around on it for a couple of weeks, but then I realized I just couldn't do what I needed to do anymore. It got too painful. So I went in for X-rays and it turned out to be broken and they shut me down right away. I missed about 10 weeks." When Alamo returned to action on July 13, he struggled to regain his timing at the plate and his footwork in the field. "I just stunk," he said. "The first couple of weeks back were a real struggle. Trying to hit the pitching at this level is hard enough, and then not playing for 10 weeks just made it even more challenging. But I got to play a lot, and I finished the season strong." On Aug. 25, Alamo was called up to Double-A Tennessee. In five Southern League games, he collected four hits and scored a run. "I only saw him briefly in Tennessee, but I have seen him in the past. Things like instructionals, Spring Training, my work with the catchers, and what jumps out at you right away is the work ethic," Smokies manager Mark Johnson said. "He's a super-hard worker, his work ethic is off the charts, and he loves baseball. It's actually infectious at times. "But when he joined the club at Double-A, you could see the pure excitement of being promoted and being back on the field, and he just jumped right in it. The game is a lot faster here than the lower levels, and he just jumped in and caught some really nice games. He did not miss a beat. To call and run a fantastic game at a new level right away, there's something to be said about that. It definitely shows a level of fearlessness." It's not hard to guess where that comes from. Although Alamo has not participated in Artesia's Memorial Day Weekend festivities since turning pro, he acknowledges he still thinks about them and misses the experience every year. But with the Majors in his sights and an entire community behind him, the would-be bullfighter understands what challenges he faces and hopes the values ingrained in him as a child coupled with a clean bill of health get him to the highest level. "I wish I could go back [to Artesia], but it's good to know that everyone back home is very supportive of me -- even though I don't play soccer," he said with a laugh. "But my focus now is just to stay healthy so that I can give myself a chance to stay on the field. I know that I can perform and I know my abilities. I just need the chance to be out there and do it. I know that if I didn't get hurt, I would have been at Double-A sooner, but that's out of my control now. All I can do is, hopefully, start there this year, win some ballgames and just keep getting better. "Growing up and watching my dad perform, that gave a competitiveness to me. He was really good at what he did, and everyone knew who he was, so that made me really proud of who he was. Just watching him go face-to-face with a bull and be fearless, I think I adopted that into my own life and use it to play baseball."